Spring is here, and for those of us who live in the northern hemisphere, this season brings with it a very special kind of awakening. Restlessness and wanderlust is pulsing in my blood in sync with the melting of the snow and the birds tweeting. 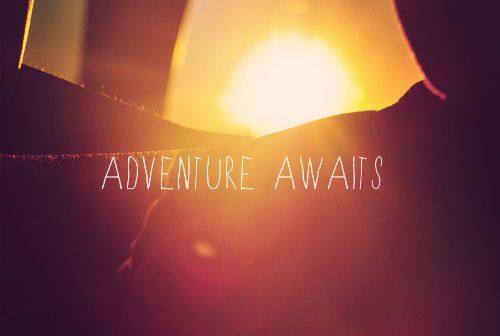 The sun is starting to warm up, and so is my urge for adventure and exploration. It's time to start moving again! I can tell I am not alone in yearning for adventure and travelling, by the numbers of e-mails received and dreams shared. Since travelling abroad for extended periods of time isn't always possible – and I definitely share your frustration when all you want to do is go! go! go! – I thought I'd share a few notes on how to stay inspired while you are waiting for the opportunity to make that trip happen. It is often easier to see when you have a purpose and an intention. Bring a camera on your next walk and take some photos of your little corner of the world. You can choose to share your photos on social media and give the people in your life who live far away a chance to experience the world from your perspective. I don't know about you – and I blame Instagram – but I always find it easier to appreciate my surroundings with a pretty filter and a little carefully selected blurring! When we are at home, it is so easy to get caught in routine and mundanity. To avoid this, try to make a change by walking a different street, driving a different road, or visiting a different café the next time you are out. Just doing something so simple as getting off the subway a stop too early, or doing your grocery shopping in a different store than usual may bring about a welcome freshness and inspiring change in your life. Having an old-fashioned penpal – or a more modern version of this old phenomenon like an e-mail buddy or a skype friendship – can help you see your life with a different perspective. Talking about the weather is a lot more interesting when your friend lives in a completely different climate! When describing your life, pay attention to detail. What is really going on in your life right now? What is exciting, new and different? What does your daily life look like to someone who has never visited your country or your culture? Doing something creative on a daily basis forces you to see beyond what is normal, familiar and obvious. Samantha Reynolds of Bentlily is the master of daily poetry writing, and I really recommend reading some of her poems for inspiration. Try not to worry so much about the quality of your work though, because this can really defeat the purpose. Instead, try to capture a feeling, an image or a sensory experience as accurately as possible. Can you see how this forces you to be present? Daily journals aren't only for travelling and teenage girls! What you would normally write about in a travel journal – the places, the experiences, the people – can be just as interesting to capture from your daily life. What is the most interesting place you went to today? Who said what? Did you see anything out of the ordinary? Journaling – or blogging – is a powerful way of forcing yourself to open your eyes. This might be a little extreme, but one of the things I really enjoy when I'm travelling is the limitation of choice when it comes to my wardrobe and accessories. It is so much easier – and creatively challenging – when you don't have to dig through a huge closet to find something to wear. To get this feeling at home, I suggest going through your closet and select no more than a suitcase's worth of clothes and then commit to only wear these clothes for a set period of time. This would be a really fun challenge, don't you think? What makes travelling so different from being at home is our increase in courage. Suddenly trying new things doesn't just become an option – it often becomes the most natural choice. Truth be told, I see absolutely no reason for this. Why can't we just try something new when we are at home? A Bikram yoga class, an exotic dinner recipe – or learning how to surf if you live by the ocean – a lot of new things can be tried from the comfort of your own hometown! Similarly, extraordinary experiences doesn't have to be reserved for travelling. One of the most amazing things I have done in my life was watching the sun rise over the Angkor Wat in Cambodia. However, I have never deliberately watched the sun rise i Norway. Isn't that a shame! A good way to come up with ideas is to imagine what you would do if you were going to your dream destination. I promise you that a lot of the awesomeness can be experienced where you are too. It might not be the same, who knows, it might be even better. Nothing forces you into seeing the place where you live with new eyes than hosting a friend who is visiting your city. Where do you take them? What is typical and special about your city? What is particularly beautiful or interesting? What is the one thing they just can't miss? If you don't have any friends who are willing or able to visit you, why don't you try to host a coach surfer? Or rent out your spare room with AirBnB? Hosting friends (or potential new friends) from abroad will also give you a little taste of their culture. Maybe you could ask them to cook something exotic for you to return the favour? If you can't go to France right now, why don't you have fun with making a themed party? Or maybe you could have a Francophile week with your friends where you only wear chic clothes, watch French movies and say au revoir! when you leave? Just imagine all the wonderful countries you could "visit" like this. India week filled with yoga, vegetarian food, Bollywood movies and colorful, comfortable clothing, anyone? Another great way of getting a little taste of newness is to move things around a little bit. If you feel particularly restless, you could even combine this with a spring cleaning... Anyways, the point is to force your mind out of habit mode where you look at your things every now and then, but not truly see. You don't have to do much, just a little rearrangement of your wall decoration, your books or your plants could be just what you need to make your living space feel fresh and new. It is definitely possible to go on vacation even when you can't travel. All you need is some time off and a list of things you are yearning to do in your neighbourhood. If possible, take a few days off work or studies (combine it with a weekend for maximum time off) and dedicate the days to completely relax, unwind and have fun. Try to avoid doing chores that you wouldn't normally do while on vacation. The dirty laundry won't go anywhere, so relax! If you are unable to take even a few days off your normal life, a do-nothing-day can be juuuust the right thing for you. I first heard about "do nothing (wrong) days" from Rachel Cole, and later read about the concept in Sabbath by Wayne Muller (which happens to be one of my favourite books ever!). The idea is simple: Just do nothing, or exactly what you feel like for one day. Nothing is wrong, nothing is too much, too little or not enough. Just follow your inner yearning, what do you need the most right now? I am willing to bet that you haven't experienced your home town to the fullest. I am willing to bet that there are great museums, new cafés, restaurants and hidden treasures right on your very doorstep. A good way of finding the gems in your own city is to buy a travel guide. Luckily, someone has already researched, tried, tested and explored your city and written about it! If you live in a big city, I recommend Time Out travel guides, but Lonely Planet is also a very good choice. The highlight of any journey is the shopping and the massages, right? Or wait... is that just me? Well, the good news is that you don't have to travel to be able to shine some light on your body and soul in the form of a treat. Some good (and inexpensive) treats could be a magazine, a rich hand lotion, a new nail polish, a notebook or maybe a caramel macchiato. I also suggest to have a spa day, either at home or at your local spa. The point is to treat yourself to something extra, something you would easily allow yourself while on vacation, but don't normally do at home. I think the main difference between travelling and everyday life is that when we are travelling we are much more present. When we are in a new place, we are forced to take it all in because or mind is not working on auto pilot. If you have ever found yourself arriving at work and then not remembering the drive, you'll know what I mean by auto pilot. Most of what we do every day is highly automated and this is a good thing. It would take a tremendous effort to do even normal chores if you had to do everything as if it was the first time! However, I think we all can benefit from a little more mindfulness in our daily life. The key to living every day as if you were travelling is to be present. In other words; be. How do you deal with wanderlust when you can't travel?